BeautySouthAfrica - Skin & Body - Are you applying your beauty products correctly? Are you applying your beauty products correctly? When it comes to taking care of our skin, it seems that what counts is not only our choice of products but how we apply them. Just as important as the products themselves, your skincare techniques can make all the difference in getting the most out of everything you put on your skin. Activating, massaging, soothing and de-stressing, putting that little bit more time into the way you apply can turbo-charge your products and tackle those everyday skin problems head-on. From cleansing to moisturising, oils to face masks, we’ve asked top skin care experts for their insider tips on how to really work those products for radiant, beautiful skin. When it comes to skincare on the face, many of us tend to be cautious, concerned about over-working the skin or causing wrinkles. But with the right kind of technique, we can encourage drainage and de-puff and de-stress skin. ‘Taking the time to massage in your moisturiser or facial oil will help to detox and rejuvenate the skin by promoting lymphatic drainage, which in turn reduces puffiness, redness and evens skin tone, leaving the skin with renewed radiance and beauty,’ skincare expert Liz Earle explains. Cleansing skin thoroughly twice a day is a hands-on way to improve radiance and achieve a clear complexion. For foaming cleansers, start by working the product with your hands first to get it active and then apply to the face using light, circular movements with your fingertips. You may prefer to leave the cleanser on for half a minute for deep cleansing. Thorough rinsing off of the cleanser is crucial and if you’re not using a muslin cloth, make sure to rinse skin with around handfuls of tepid water. To exfoliate, pat skin dry after cleansing but leave it moist. Add a small amount of product to hands and gently massage onto your face in upward circles. Try adding a little water as you go to help the formula activate. 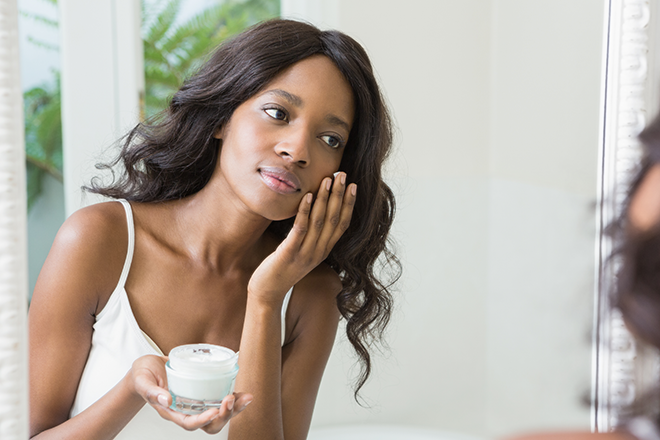 We’re all guilty of switching our moisturisers when we don’t see instant results, but spending that little bit of extra time working with the product can help it bring out the best in your skin. Apply your moisturiser immediately after cleansing when skin is still slightly damp as this helps lock in the water, preventing evaporation. Remember to work your moisturiser onto your neck and décolletage also in upwards movements to help stimulate circulation and give skin a lift. While those of us with combination or oily skin may be a bit wary, oils can be hugely beneficial for all skin types, just as long as they’re applied in the right way. Remember to apply oil after cleansing but before moisturising. I love using coconut oil on my face ,is that safe to use especially for the massage? When it comes to skincare on the face, many of us tend to be cautious, concerned about over-working the skin or causing wrinkles. The “applying oils” Section… I have a question, does the “oils” refer to serums and boosters? What oils are you referring to exactly? If you cleanse then moisturize, when do you tone your face?